What Can I Expect as a Bounty Hunter? 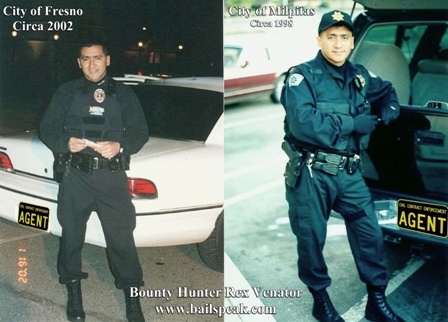 REX VENATOR put actionable military and civilian law enforcement training and experience into service as an upstart bounty hunter in the early 90s and has flourished into the Number 1 bail education school instructor who is now teaching private and public classes in Roseville, Sacramento, Modesto, San Jose, Bakersfield, Los Angeles County, Riverside County and San Diego County with all of which Approved by the California Department of Insurance as a dual certification course for those wishing to get people out of jail, put bail jumpers back in jail, and to lawfully attack procedural technicalities in open court via the bail motion to set aside forfeitures and exonerate bail bonds as an agent for numerous property and casualty insurance sureties. I recently posted numerous job openings to include bounty hunting positions. Each of the real-deal employers requesting inclusion in the post were not looking for “bail enforcement agents” or “fugitive recovery agents” or a ‘National Director of United States Fugitive Recovery Task Force (illegal verbiage in California) Warrant (a crime to claim in California) Service’ or whatever it is people from all over the United States are calling themselves these days; they are looking for “BOUNTY HUNTERS” to fill hourly and salaried positions with benefits. Every person must follow their own state laws, but California, for example, has 58 separate counties and each county has many, many different law enforcement agencies with multiple shifts and with numerous courthouses and none of them do everything exactly the same. Now extrapolate this very true reality to all the states where there is commercial bail and present an argument on what people should wear, identify as, and see if it works in all places at all times; it does not work and may be illegal in my long experience. Recently, I’ve come across various posts wherein people are writing in pejorative terms about how other people operate in areas where the subjects of ostensible ridicule may or may not be experts in their very specific areas of operations. I’ve refrained from replying, but allow me some simple latitudes. Here we arrive at the above video included with this opinion editorial. The video clips are of old and recent very real wanted felony bail fugitive locations. How is one supposed to approach these locations with just weeks or days left to close a bounty hunt? Is some largely anonymous and self described experienced bail enforcement agent or fugitive recovery agent really qualified to tell you how to dress, what to call yourself, and how to act when working to apprehend a hard pressed and desperate wanted felony fugitive hundreds and even thousands of miles away? Really? Are you sure? Personally, I operate in such a way and manner that is right for my state’s laws, my geographical location, within the tolerance of each and every local law enforcement jurisdiction, and I will never allow anyone to dictate how I should approach that felony hazard location or tell me how to dress or what to call myself. I am a Bounty Hunter when I am bounty hunting wanted misdemeanor or felony bail fugitives for the purposes of enforcing a private, civil bail contract and nothing else. If I were licensed to work in Nevada, for example, I’d be calling myself a “Bail Enforcement Agent,” but I don’t work in Nevada. While California’s legal term is “Bail Fugitive Recovery Person,” there is no law disallowing myself to call myself a bounty hunter to avoid long conversations everywhere I go and knock. As for my background, there are photographs going back decades and loads of videos going back long before there was YouTube or Facebook and showing, NOT TELLING, where I come from. Education really does matter, and I encourage people to seek out and secure reputable bail education in the same exact states where one is planning to operate as whatever one’s state calls bounty hunters. Y’all be safe and watch your hindquarters out there because it is YOUR six on the line and not some whoever who is not an expert where you operate and tells and does not show. Like any other set of professions, bounty hunting and bail bonds takes sticktoitiveness to the end goal, immediate and unwavering family support, resiliency to the pains of failures, and repeating the process in the wake of success to stay successful. It has been asked, “If you wrote a book about your life, would anyone want to read it?” The answer to the question is a personal one, and the story may not have become history just yet. Whether the answer is a yes or no is up to the individual. It takes a lot of gumption to earn the contracts, track, locate, identify, apprehend, and book a wanted felony fugitive looking at 25 to Life after bailing such a person out of jail in the first place. It takes a special kind of person to do such a thing in both cases, and I’m pretty sure someone would read that book. The only remaining question and answer is both ambiguous and clear; how will you be remembered – believe in yourself. HOW MUCH MONEY CAN A BAIL BONDSMAN MAKE is wholly contingent upon a rather protracted set of circumstances rooted in the past, existing in the present, and potentially coming to pass in the future. Stated differently, this is not a question that can be honestly answered by anyone due to the expansive set of variables involved in bail bond underwriting. One thing is certain, however, with high-gain comes high-risk to the extent that a bail bondsman who gets people out of jail is guaranteeing the appearance of the accused to be present at all court ordered hearings, trial, and, if necessary, to be turned over the California Department of Corrections. Bail bondsmen do not make money hunting bail bond fugitives; bail bondsmen make money getting people out of jail. Bounty hunters make money helping wayward bail bond clients back to have dinner with their sheriffs, lunch with their judges, and, if applicable, three squares a day, stimulating conversation, and some quality time with a warden’s corrections staff. To these ends, not all bail bond fugitives are so quick to protect the monies and properties put up as collateral by their loved ones as security on a bail bond contract by self-surrendering or “going in quietly.” It takes a special kind of hunter to make this happen with such ornery folks. A good bounty hunter or team of bounty hunters can help a bail bond agency make loads of cash if the bail bondsmen involved are confident in “taking chances” on risky bonds, but such chances come with the historical fact that proper, timely, and relevant bail education really does matter in order to keep all parties involved out of the hospital, ICU, criminal court, civil court, bankruptcy court, and even the county morgues. BAILSPEAK is a California Department of Insurance Approved Bail Education School with instructors who are on the front lines posting bonds in the jails, legally hunting people on the lesser known mean streets of California, legally jousting with lawyers before judges in the California Superior Courts, and in classrooms from Sacramento to San Diego and many counties in-between and that are intentionally kept small in the best interests of those students in attendance. Thank you for your time, Rex – Bailspeak’s Primary Bail Education Instructor.